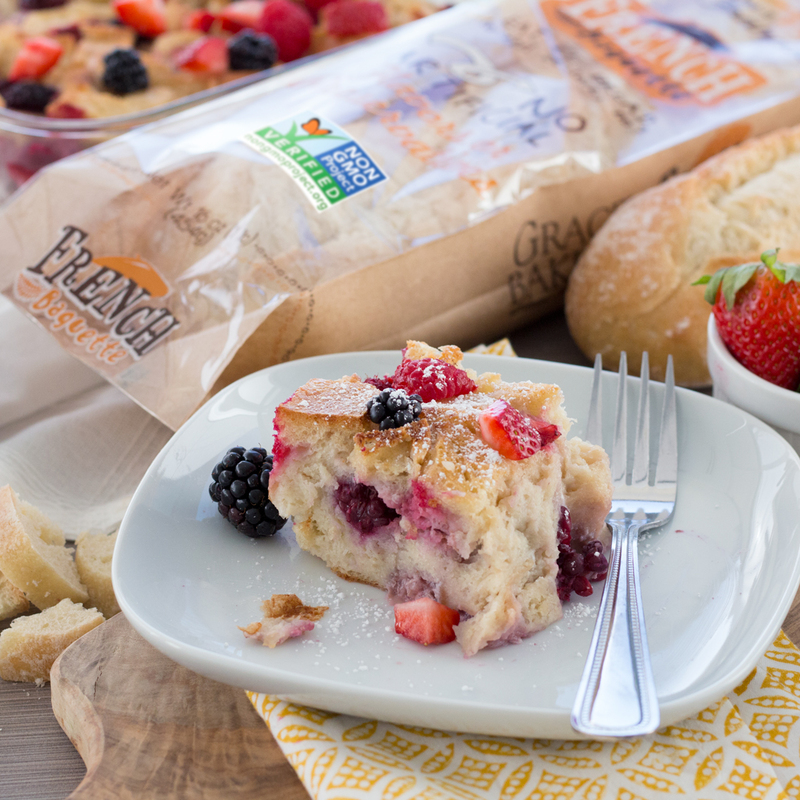 Baking the perfect baguette isn’t as easy as it looks - which is why you should be thrilled that Grace Baking decided to share this way-too-good Berry French Toast Bake recipe - made with their absolutely authentic tasting French Baguette. It’s a winner, and not just because it’s French. Breakfast is always better when it tastes like dessert, and filled with sweet, sweet berries and dusted with a pinch of powdered sugar, this is one breakfast you’ll be having beaucoup. Bon appetit! Spray a 9-by-9-inch casserole dish with nonstick spray. Fill pan with half the bread cubes. Add about ⅔ of the fruit and gently mix with your hands to distribute the berries evenly throughout the dish. In a mixing bowl, whisk together the milk, eggs and vanilla. Carefully pour the mix over the bread and berries. Gently press down on the bread to ensure every piece gets soaked. Cover the dish and set in the refrigerator for at least 30 minutes or overnight if possible. Preheat oven to 375ºF and bake until set (approximately 40-60 minutes). Remove from oven and top with remaining berries. Dust with powdered sugar and serve.